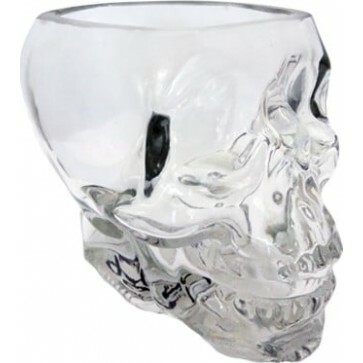 Shout SKULL instead of SKOL when spiritedly toasting with libations poured into this sparkling Glass fashioned to resemble a human skull minus the crown. Approx. 3 3/4" x 4 1/2" x 3 3/4". Made from blown glass. Shout SKULL instead of SKOL when spiritedly toasting with libations poured into this sparkling Glass fashioned to resemble a human skull minus the crown. Bound to draw attention at your evil genius/Shakespeare/Halloween themed parties. Doubles as an essential and quite dramatic hand prop for your tipsy soliloquies as well. Approx. 3 3/4" x 4 1/2" x 3 3/4". Made from blown glass.